NAVIOP NRG is the new system born to manage and control the whole electrical plant directly from the touch screen display. Perfect solution for small size boats, where the optimization of spaces and costs is crucial, NAVIOP NRG enables to eliminate the electrical panel and manage the lines through a compact and cheap power distribution system. 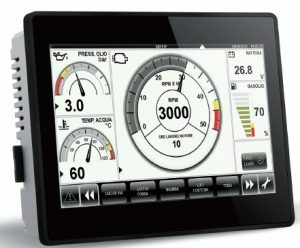 Based on Genius Glass 7 touch screen, NAVIOP NRG features up to 16 monitored and controlled circuits from NAVIOP EGON distrbution board, able to supply power to the all boat. NAVIOP NRG is a 9-32 volt system able to monitor and control circuits, such as navigation lights, stairs lights, cabin lights, engine lights, pumps, etc. For further technical information on the NAVIOP NRG Ready-made solutions, please refer to the technical data sheets.